A film director wants to do a documentary on a moose, but this particular moose has other plans in mind. 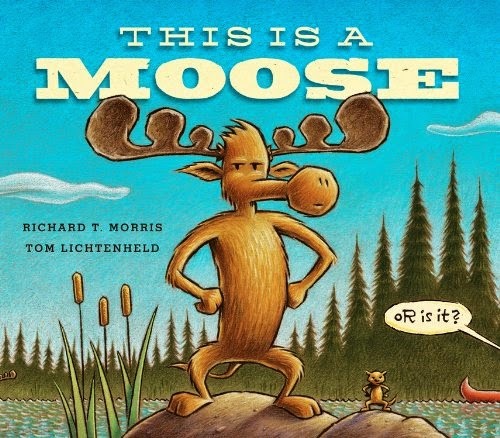 He doesn’t want to just walk in the woods, doing moose things—he has a dream! So with some help from his friends, he may just accomplish it. And the movie director will just have to deal with it. Maybe he’ll want to come along? It’s hilarious. And you know how much I love hilarious picture books. The subtle jokes, the overall comedic plot line…it's just so good! Plus the illustrations are also fantastic, and fit well with the story. They’re done in a color pastel that adds the perfect amount of texture to this story in the woods. Besides the funny-ness, and pretty-ness, it is actually an educational look into movie making. It’s informative and factual. Good for a storytime about woodland creatures or to encourage the little movie makers in your life. Go and read!